Are the Veranda/Garden Rooms available in multiple colours? There are several different RAL colors to obtain. The base colours are RAL 9001 (Crème white) RAL 9016 (White) RAL 7016 (Anthracite textured ). Other RAL colors can be ordered at extra cost. Is it easy to assemble a RoomOutdoors Veranda/Garden Room? Yes, our Veranda/Garden Rooms are preprocessed and there is also a clear DVD available. This video is also available on our Youtube channel. What if I need to paint my window-frames? The construction can carry 75 kg to 90 kg per m2. We advise not to stand directly on the plates. The best way is to put the a shelf with a spool on the construction. You can always release the rubbers and the plating . Is there always a 3rd pile needed? When a Veranda/Garden Room is 400 cm our more you will need a 3rd pile. If the customer does not like a 3rd pile, it is possible to get a reinforced gutter (at extra cost) or reinforcement beam 15 cm (also at extra cost). How is the connection against the wall? A Wall profile is put firmly by means of dowels. The top is sealed with silicone. Should there be a foundation? When you have a Veranda/Garden Room with roof usually concrete footings are used. One then needs a concrete prepared with drainage, and depending upon the width of the front Veranda/Garden Room, one or two standard footings. When you want for example a glass sliding wall, a concrete edge underneath is needed. If you want to place door frames, a foundation must be provided. Are the veranda's maintenance free? No, we call it maintenance free, but a Veranda/Garden Room should occasionally be cleaned. A porch of aluminum is very easy to maintain. How many years do i have warranty? 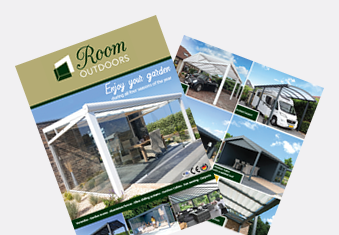 RoomOutdoors gives standard a 10 year warranty on the aluminum and a 10 year guarantee on the polycarbonate sheets. If we assemble the porch with our assembly team, the customer always have 1 year of warranty on leaks. What if there is a leak? If we have assembled with our own assembly team and the leak occurs within one year, we will repair it for free. Are the plates UV resistant? The plates are UV resistant on the top of the plates. The standard Veranda/Garden Rooms are always in stock, we guarantee therefore delivery within 5 weeks. How long does it take to assamble a veranda? When it is placed with two people, usually the roof stands within a day. How many watts are the lamps? Halogen 20 watts per lamp. LED 2 watts per lamp. How many lamps can i connect to a transformer? Up to 3 spots on one transformer. How many watt does a heater have? A heater has a wattage of 1800 watt. How much distance must there be between the roofing and the heater? Beacause of the heat, we recommend +/- 40 cm distance between the heater and the roof of the veranda.